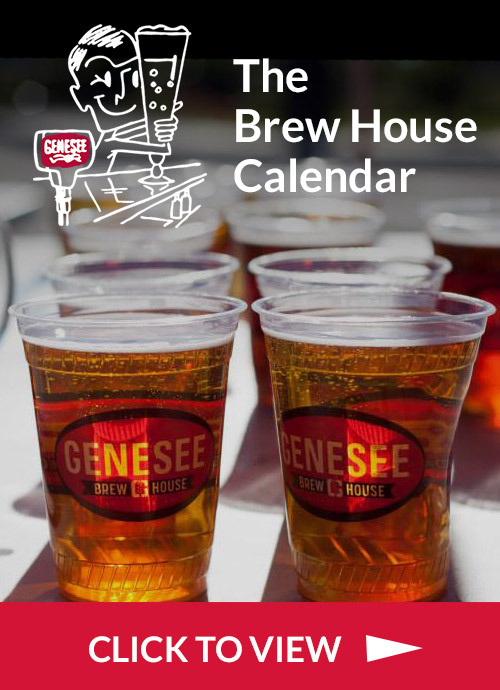 Once a century-old packaging center, the Genesee Brew House has transformed the 9,200 square-foot space into a beer destination, featuring interactive exhibits, multimedia content, gift shop, pilot brewery and pub-style restaurant. 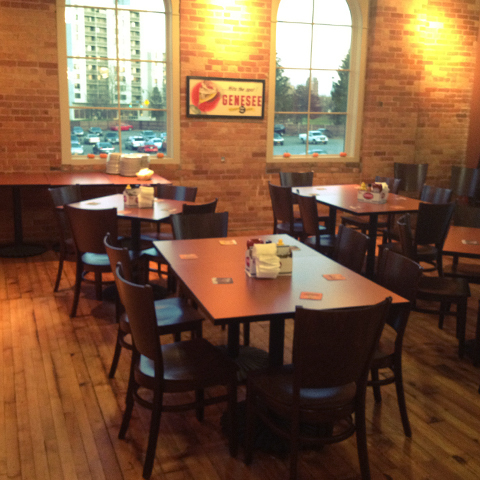 The Genesee Brew House is the perfect location for special events, business meetings and celebratory group dining. Our fun, lively and casual atmosphere set in an “Industrial-chic” environment is complete with high ceilings, granite counters, exposed beams, wood and metal accents. Hand crafted brews, combined with a number of our dishes, bring a festive feel to your celebration or special event. Whether you are planning a formal or causal gather, the Brew House is sure to wow your guests with our unique atmosphere and service. 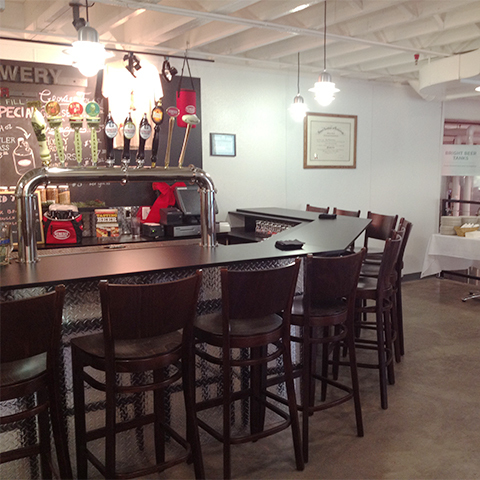 Private room, glass doors, private bar, over looks our Pilot Brewery. Bar stools and high top tables make this space ideal for cocktail events for up to 50 people. $75 setup fee & contracted food & beverage minimum apply before tax and 18% gratuity. 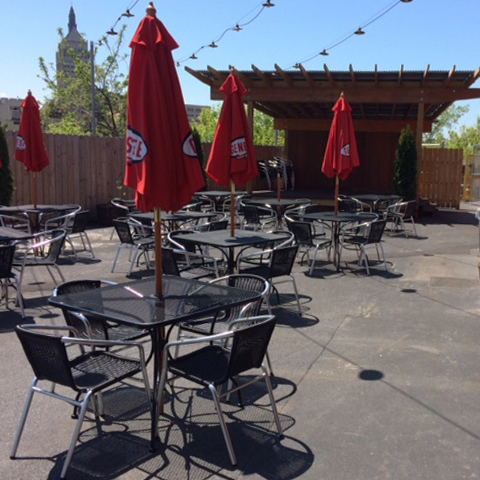 Outside event space, 4 tap bar, casual patio seating, overhead strung lighting. Ideal for cocktail events up to 100 people and dinners up to 65 people. Roped off section of the Main Dining room. Ideal for cocktail events up to 30 people and dinners up to 25 people. Seating can be arranged to spur conversation and allow guests to mingle, or have your entire party seated for a more formal setting. A section of the bar near the area can be reserved as well. 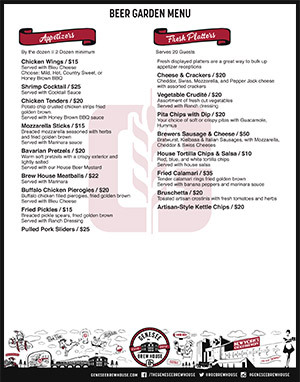 Host required pre-order food from our Appetizer or Buffet Menu. 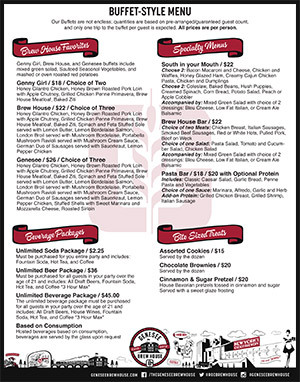 What does booking a Private Event at the Brew House entail? Booking a private event at the Brew House allows you to reserve a particular area of the restaurant for you and your guests. Most areas can be booked as private events, while some area may only be semi-private. We ask that you please fill out and submit our online event inquire form, you will then be contact by our staff. If you require immediate assistance please call our Events Coordinator Kristen MacEllven at 585-353-0201. What do I need to provide to reserve event space? We require a signed contract and credit card on file to secure a private event space. All charges are due at the conclusion of the event. The credit card on file will not be charged unless specified by the guest. Please read over your contract carefully as we do have cancelation fees. Is there a charge to rent private areas? No. However, all areas have Food & Beverage minimums. This means that you and your party must spend a predetermined amount before tax and gratuity. If the minimum is not met, the credit card on file will be charged the difference. Can I rent out the Brew House? Over the years the Brew House has become a popular travel destination. As a result of this we always experience high volumes of foot traffic throughout the year and we want to always be available for our guests. For that reason we do not shut down for private events. 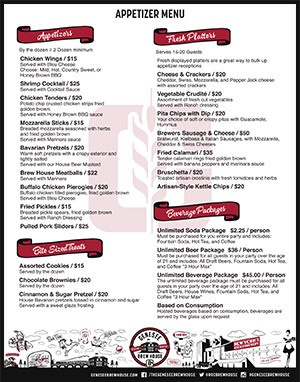 Do you have beverage packages? Yes, guests have the option of purchasing a beverage package priced per person or have a running tab where beverages are charged based on consumption. We can also provide drink tickets to help you limit the beverage offerings at your event to help you stay within your budget. We apologize but we do not allow in any outside beverages. We have 16 beers on tap and great selection of NY State Wines for you to choose from. We do not serve hard liquor at our establishment. Can I bring extra food home off of the Buffet? Based on NYS Health Regulations, we do not allow food to go home with guests off of the buffet. This is for yours and your guest’s safety. Yes, you may bring in any decorations as long as they are not obtrusive or disrupt general service. If you are unsure if an item is appropriate or not, please feel free to contact our events coordinator and ask. The Brew House has a very large parking lot conveniently located right in front of the building. You may park anywhere in the Brew House lot unless otherwise specified. Can we bring in our own music? The management staff does a great job in pre-selecting music that we hope will appeal to everyone. While you cannot bring in your own music, we can try to adjust the volume should it be too loud or soft.